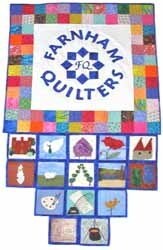 Farnham Quilters was formed in May 1996 and was attended by six ladies on the first meeting at Farnham Maltings. Over the years the numbers have steadily risen, but at the moment we have room for some more new members. Please contact us via the contact form if interested. On the 2nd Monday of every month at 7.30 pm till 9.30 pm. Come and see Aldwick Quilters Show & Tell at our April meeting.